Web Print is a a web-based printing service that allows quick printing on campus from your own laptop to any public computer lab printer. Lab Seat allows you to check computer availability in real time before you leave for the lab. This is especially useful during busier times such as finals week as you can choose where to study by how many computers are available. Web Print and LabSeat can both be reached by typing key words: LabSeat and Web Print into Quick Links search from the inside.manhattan.edu site. The Glance MC App is a also a useful resource which allows clients to view a compilation of features: including Jaspernet card, School Calendar, links to LabSeat, Web Print, Campus Directory and the Quadrangle etc. The Glance MC App is available in the iTunes App Store and on Google Play - simply search for “Glance MC”. 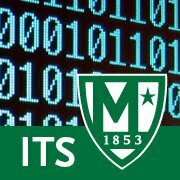 For more information on this student-developed app, see the ITS Glance MC Mobile App page. Hangouts Meet has just added a new feature which allows you to connect to a meeting using a phone number as an alternative to the meeting code. This includes when you’re away from your computer, like if you're commuting or don't have a data connection, and you need to call into your Meetings while on the go. This feature will automatically be selected when you select the Hangouts Meet conferencing option while creating a calendar event in Google Calendar. Note that this dial-in feature uses an international phone number, which allows meeting participants in other countries to join the meeting. Plan B: If full disk encryption wasn't a built-in option, find a free or fee version of full disk encryption software that works with your operating system and personal capability. Check your favorite review sites or try Slant for recommendations. Failsafe: Remove and destroy the drive (Geek Squad offers a three-minute tutorial on hard drive disposal). Most retail stores that accept computer donations for safe recycling will remove the drive and give it to you for secure destruction—just ask them to do that. Hold onto the drive until there's a secure shredding event at work or in your community. We know that sometimes when clients submit a ticket, they want colleagues updated. We have enabled a new feature allowing contacts to be added to a ticket upon creation. Next time you submit a ticket using the ITS Request Form, you can add contacts in the "Contact" field. Apple has found that some 13-inch Macbook Pros (Non Touch Bar) have a faulty battery that would be eligible for a free replacement. You can check to see if you are eligible at this Apple Battery Replacement Program site. Need to send a PDF version of a document or spreadsheet? Share via URL. Physical Plant will be conducting a generator test in Horan Hall today, April 13th at approximately 10:00am. UPDATE: This maintenance was successfully completed by this morning, Friday, June 1st by 8am. ITS will be conducting planned network maintenance during the last week of May, May 28-June 1, which will cause some localized network outages.